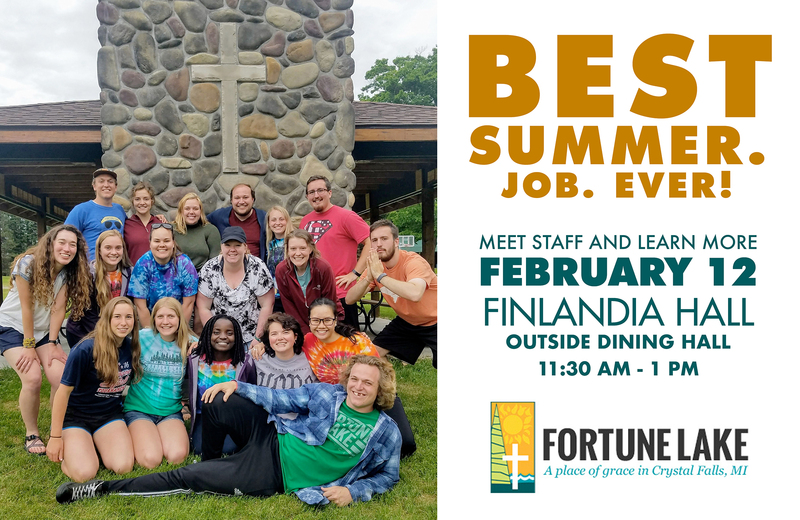 Students looking for a rewarding summer experience are invited to join the staff at Fortune Lake Lutheran Camp in nearby Crystal Falls, Michigan. The camp is seeking Cabin Leaders, various Program Coordinators, a Health Officer, a Media Coordinator, a Waterfront Coordinator, a Arts & Crafts Coordinator, Day Camp Coordinators, Maintenance Staff, and Kitchen Staff. Camp Director Amanda Rasner will be outside of the café in Finlandia Hall on Tuesday, February 12 from 11:30 a.m. to 1 p.m. to meet students, answer any questions they have and schedule next-step interviews. Online applications and more information is available at at fortunelake.org.